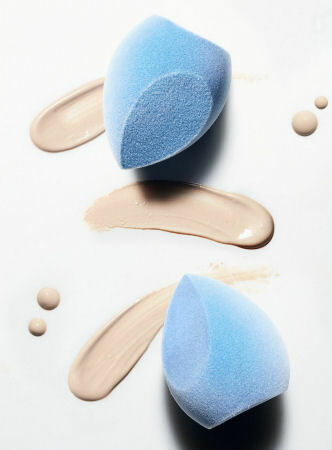 Earlier this month, we told you about the velvet microfiber makeup sponge from Juno & Co. There’s another powder blue sponge that landed in my hands with its own unique qualities. There are squishy makeup blender sponges and there are silicone makeup blenders. Makeup junkies extol the virtues of each. The squishy, egg-shaped versions blend and buff to airbrush-like perfection. The silicones waste a minimum of cream product. The Makeup Drop Hybrid sponge is cornflower blue, shaped like a teardrop, is squishy, and features both a spongy and a flat silicone side. The latter is perfect for anti-bacterial application with no waste, since it doesn’t soak up product, while the former will allow you to blend, blend, and blend some more. It’s like having two tools in one. You will wonder how you ever lived without it.